Noise: You have a new CD coming out. Tell us about it and what can we expect from your new music? Johnny A: Okay, where do I start? I wrote 16 songs for this album, put a recording studio in my home. I’ve arranged all of the songs, produced/engineered all of the songs and played all the instruments on all of the songs. So, in a way, this is my first complete solo album. As far as a musical direction, it’s much more groove oriented than the last recordings as well as having very succinct song arrangements, trying even more to capture a melodic style instrumentally that evokes a more vocal quality… as if lyrics are apparent, although absent. Noise: Your style has been compared to Danny Gatton as well as having some of the aspects of Jeff Beck and Pat Martino. Fact or fiction and what does this mean in plain English? Johnny A:Well, I’m flattered. Thank you. Although I don’t know how much fact there is in that. However, I am influenced by probably the same cast of characters that the aforementioned were influenced by and have ultimate respect for Jeff Beck, Pat Martino, Danny Gatton, as well as a ton of others. They are all superior players. Noise: How come there has never been reunion gigs for your late ’70s band the Streets or your ’80s group Hearts on Fire? Are you anti-reunion? Johnny A:Quite honestly, I’m not very interested in going backwards. Noise: You walk the fine line between rock, jazz, and the blues. Among musical influences you cite the Beatles, Everly Brothers, Wes Montgomery, Chet Atkins, Jeff Beck, Steve Howe, Hendrix, and Les Paul. Care to clarify? Johnny A:I have very eclectic, varied tastes. I love melody and I love inspired, passionate players. So, when you look at the Beatles and the Everly Brothers, what fantastic melodies they had. Wes Montgomery, Jeff Beck, Les… all extremely passionate players with a great sense of melody and phrasing as well as incredible chops. I would have to say Jimi Hendrix’s passion was second to none. And I’m not sure if anybody did instrumental music for guitar better than Chet Atkins! If there is someone who has, I haven’t heard him/her! Noise: You use your guitar’s whammy bar a lot while playing. What does it add to your performance? Johnny A:I think it adds a texture not unlike a vocalist finishing a note with a nice natural vibrato. From my perspective, It also emotes a certain warmth to the phrasing. Noise: Gibson Custom Shop designed a Johnny A Signature Edition Guitar per your specifications. What’s different about this axe and why aren’t you just a Les Paul or Strat guy? 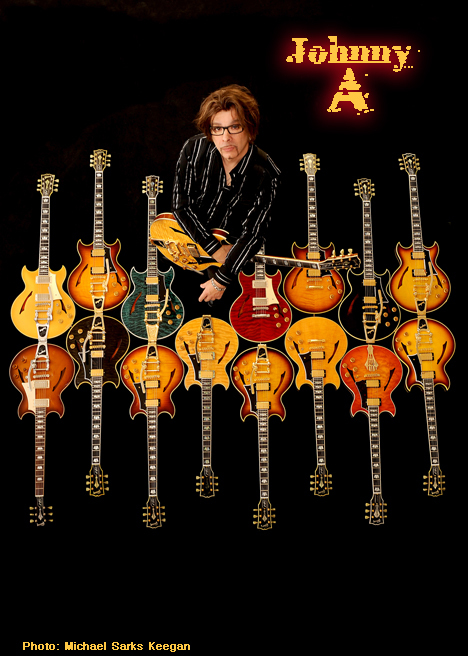 Johnny A:Well, I used to play a lot of different types of guitars including a Gibson Les Paul, but I was looking for a certain quality in a guitar, something that combined the qualities that a lot of my guitars possess. I had the opportunity, when Gibson approached me, to design an instrument from the ground up with them, that resulted in a guitar that completely fills all my needs. Noise: Hearts on Fire lost the 1986 WBCN Rumble to punk band Gang Green in one of the most heated local events of that era. Looking back, can you comment on your group’s loss that year? Did the best band win? Johnny A: Wow. That was a long time ago! I don’t think the best band won, I think maybe the tightest band on that particular night might have won. I had disbanded Hearts on Fire months before that show and only put the band back together for that performance at the request of WBCN. My heart wasn’t in it and, as a band, we were out of shape. Noise: What’s your favorite album of all time? What’s your favorite local album of all time? Johnny A: I don’t really have a favorite album of all time. There are several of them that on any given day, for a variety of reasons, can be my favorite album of all time. Favorite local album? Sometime Tuesday Morning. Noise: In 1999, you released Sometime Tuesday Morning, and in 2010 One November Night. There seems to be a clear connection here. What’s behind the two titles? Johnny A: No mystery to the titles. My titles usually come from what’s happening around me at the time. The title song was written sometime early on a Tuesday morning and One November Night was recorded on a night in November at Sculler’s. Noise: In the early ’90s you got together the local band to support Derek & the Dominos legend Bobby Whitlock. Who was in the band and what do you remember most about playing BW’s great catalog of songs? Johnny A: As MD (music director) for that band I enlisted a bunch of local guys’ most notably Stu Kimball. The Layla album had such an impact on me when I was growing up. To hear Bobby sing and play those songs live on a Hammond with that raw voice of his was just a thrill! Noise: You spent seven years playing in bands with Peter Wolf. Care to share a cool story about touring around the world with him? Johnny A: Ha ha ha, I think I’ll keep those stories to myself! Noise: Will you finally publicly announce what your last name is? We all know it’s Greek and starts with the letter A? Here’s your chance.